Are you a foodie at heart? 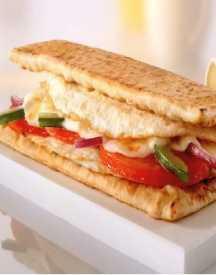 If yes, then you sure have tasted Subway and have loved the sandwiches, wraps, salads that the brand has to offer. And if you happen to be a Subway fan then there’s more good news for you. Today, you can have access to some of the best Subway deals and offers online. 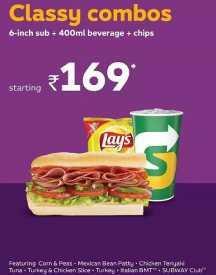 Simply browse through HappySale and you can unlock the deals and offers that are listed here from Subway. From having access to offers like Sub offer of the day for as less as Rs.99 to the Sub one plus one offer and other cash back deals, you have a world to select from. Whether you want to savour your favourite sub-sandwich or treat a friend, you can always make the most of the promotional offers and discounts that are listed here in HappySale. Browse and bag your deal today! Being a health conscious person it will be difficult at times to eat something yummy. When Subway is around you need not worry about all these. They have got the best menu that includes the yummilicious topping and also nutrition. They are making a mark in the food industry with the best ever sandwiches that are different in taste and unique in making. These are also very affordable where anyone can go and grab one for them. 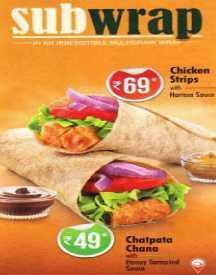 With the best offers displayed on their website, they also have many other exciting Subway offers on this page. 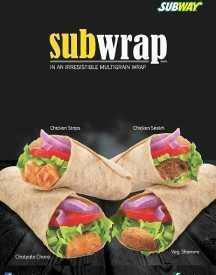 Subway is known for its sandwiches which are high in nutrition that is similar to the traditional fast foods. They prepare sandwiches and salads right in front of you with the ingredients which you prefer. You can choose any of ingredients like meats, vegetables, various bread, sauces, and condiments. All these are very fresh and promises to give you awesome taste. Their menu has some mouth watering variants like breakfast, salads, sides, snacks, bread and lot more. To name a few there are aloo patty, chicken ham, chicken seekh, chicken teriyaki, corn & peas, hara bhara sub, tuna and much more. You name it and they have it. Apart from these, they can customize the subs according to your taste buds. 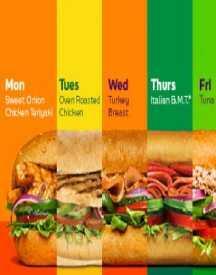 Use various Subway deals available to get the best sub at best price. How to apply Subway offer codes? Go to happysale.in and check for Subway in the search bar and press enter. There will be a list of amazing offers displayed. Copy the Code and visit Subway website. Choose from a choice of delicious sandwiches, salads, add-ons and much more. Apply the discount code at checkout page before you place the order.